Morbid obesity is a life threatening condition. Currently, surgery represents the only effective and durable therapeutic option to treat it. The first aim of the study was to estimate and compare the major surgical complications and the 30-day rate of mortality between laparoscopic and open Roux-en-Y gastric bypass (LRYGB and RYGB). The second aim was to evaluate the change in outcomes, complications, and deaths, with increased experience over the time period of the review. A random effect of the meta-analysis and meta-regression was used to evaluate surgical complications (i.e., reoperation, stenosis, bleeding, surgical site infection, fistula, internal hernia, and incisional ventral hernia) and the rate of mortality after LRYGB and RYGB over time. A search of literature from 2000 to 2014 led to the selection of 17 papers. When looking at surgical techniques separately, we observed a higher rate of mortality for open surgery (death rate 0.82 %, 95 % CI = 0.49–1.23) compared to laparoscopic surgery (death rate 0.22 %, 95 % CI = 0.09–0.40). This difference resulted highly significant when the two techniques were formally compared (p < 0.001). The improving of surgery technique resulted in a mean rate of mortality reduction of 0.069 %. Laparoscopy represents the approach of choice for bariatric surgery. Contemporary reports of LRYGB show low mortality rates and progressive decline in postoperative complications. 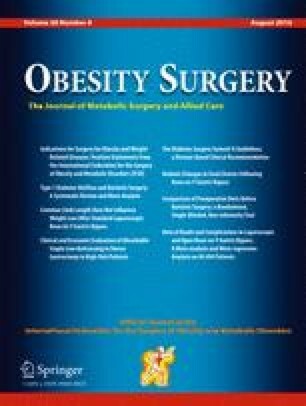 Laparoscopic bariatric surgery requires advanced laparoscopic skills, and probably an extended learning curve is not accounted for by current mortality statistics. Emanuele Rausa, Luigi Bonavina, Emanuele Asti, Maddalena Gaeta, and Cristian Ricci do not have any sources of funding for research and/or publication. World Health Organization (WHO)_Obesity. Available at http://www.who.int/mediacentre/factsheets/fs311/en/ (last accessed 15 August, 2015). In.